So here's a special place for those who would like me to create for them an avatar, a signature or even a wallpaper! Just tell me what you'd like, write down your special requests and/or send me some pics and I'll create something for you! Well fantastic, she's now in buisness! lol. I'll have a signature soon if you wanna see some other exemples she can do. Well as you can see, my signature made by welley. 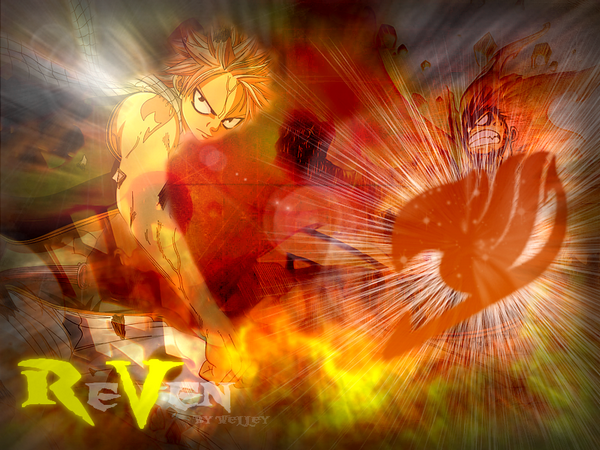 There aren't too many Regal pictures around so could you make a cool Natsu sig and avatar? He's from the manga known as Fairy tail. I'm not too specific on the look so just do your thing. So finally, here's the avatar I did for you Reven This is just an idea I got so don't hesitate to comment if you'd prefer something more classic or with another background. Your opinion on this one will help me to design your signature after. Thanks Welley I really like it. You're really good with this sort of stuff ya know? I did those 'cause I really had some time to waste so don't feel obligated to use them haha, it's more for fun that I did them than anything else. OK!!! So here I come again! You're prolly begining to be bored right now huh? Personaly I think there's a little bit to much light and that there's some characters we can't see clearly 'cause of that. yep, you're right. Maybe put it more dark like the one we have now and thanks for the avatar! Miss Welley, do you think that you could make a some more art designs for me if I were to send you a drawing of mines? I would like you to make me an Akai no setsujoku banner. Just write Akai no setsujoku and do a wonderful design of yours that fits our forum so that I can put it on some other sites. Do it wide put not high, because on ren'py's forum the signature image's hegith max is 80 pixels which is not high. You don't have to do it 80 pixels high, I can adjust that myself on photoshop, just do it wide enough so it can be a kind of big picture. I hope i'm precise enough, but sorry for the hard precision, lol. LOL! Well I think I get it. Are you talking about something like that? Great! Nice job, yet again. I love the final version Wells Thanks alot. Think you could hook me up with a new profile pic of either Regal or Natsu? hmmm... I can preview my sig in my profile but it won't come out right when I post.. I'm doing something wrong..
And about you signa, well you should be able to set it in the signature section in your profile. Just type [img][/img]. But don't forget to put the picture's link between the two "img". Or else you can simply click on the image button that appears when you're in the "writing mode". It'll automatically write the first "img". Then you simply copy the image link (I puted the one for yours when I posted it) and click again on the image button to write the last "img"